I have written a couple of app's that use LINQ, however, I realized that in order to talk about LINQ I would really have to have a brief look at the ICollections pattern and extension methods. 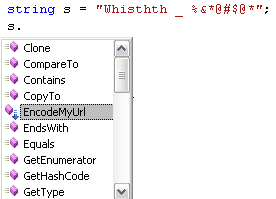 So by including the above class definition you now have a supercharged version of the string type as shown below. Extension methods are littered throughout .NET 3.5 Framework and specifically in the ICollections pattern. 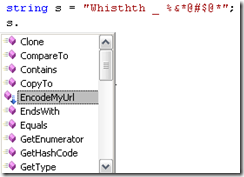 These extension give us all the access to the LINQ goodness that we are starting to enjoy. So you can imagine somewhere in the .NET Framework would be a definition above that spot welds the new LINQ methods to ICollections.